OK-500 is pound for pound the best value for the money in the Practix Line. The 500 employs 2 -45 inch curved plates back to back, with watts densities that will support belt speeds up to thirty feet/minute. The 500 is available with a top and bottom cooling or just bottom. This machine is fitted with a 10 inch touch screen control that will control every aspect of the machine. The Ok-500 is customizable with a full line of unwinds and rewinds with any accessory one could imagine. Let Practix customize a solution for you! As an added value, all of Practix’s heat transfer machinery can be customize to meet your height and color requirements. All of our products come backed by our one-year mechanical warranty and six-month electrical warranty. 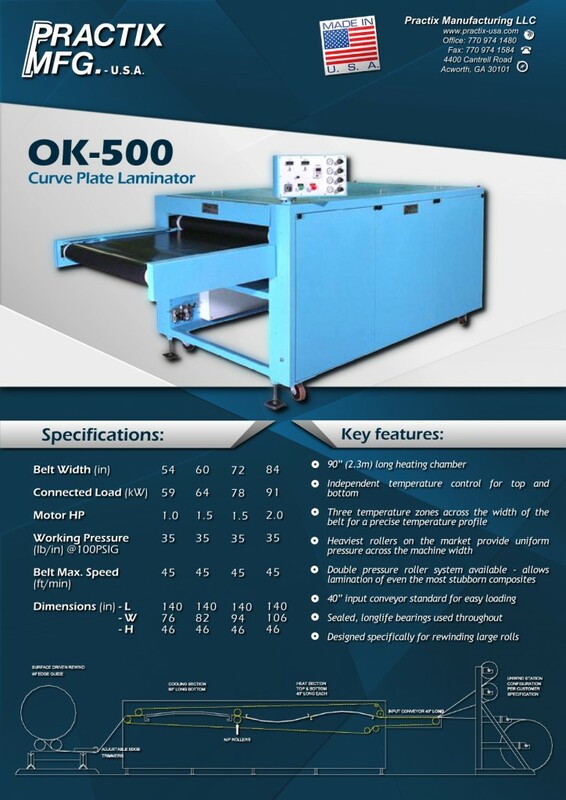 Whether you need a laminating machine for your furniture business in Atlanta or for your sporting goods factory in Shanghai, Practix offers next day and worldwide shipping options to accommodate customers anywhere in the world.